Large cupcakes-$20 for 12 cupcakes. Order in multiples of 12 of same flavor. Small cupcakes-$20 for 24 cupcakes. Order in multiples of 24 of same flavor. The maximum number of layers you can have is 2. Special designs (simple birds, animals, cartoon characters etc) can be added to the cake for an additional fee of $5. Electronic version of design will be useful. Please get a confirmation before placing the order. 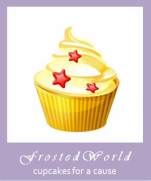 To order, please email us at FrostedWorldBakery@gmail.com or call us at (908) 429-3015. Please specify the flavor, quantity, and the date you want it by. Payment: By Cash. Exploring other options, including Checks made directly to CORDUSA. Pickup/Delivery: We are located at Bridgewater, NJ. We prefer you to come come and pickup the order from our location. We can arrange to deliver if it is really close by. Note: We have plans to publish all the orders received on this website. We will use "Anonymous" if you explicitly prohibit us from using your name.